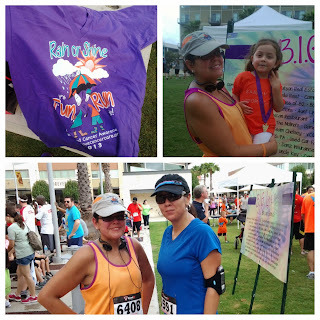 This past Saturday was the “Big Love” fun run, This love was similar to the Chelsey 5k I ran earlier this year. B.I.G. 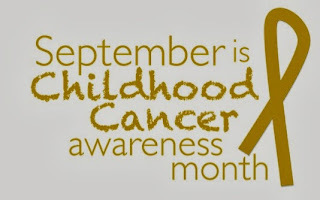 Love was created in honor of Brook Alyson Phillips, as a mother I can not comprehend having a child go through and lose their battle with leukemia. I have a 16 year old and a 3 year old and I love them with all my heart, Christian my boy reminds me of Brooke the most because he has the ability now and ever since he was itty-bitty to love unconditionally and whole heartedly – just like Brooke expressed her love to everyone around her. 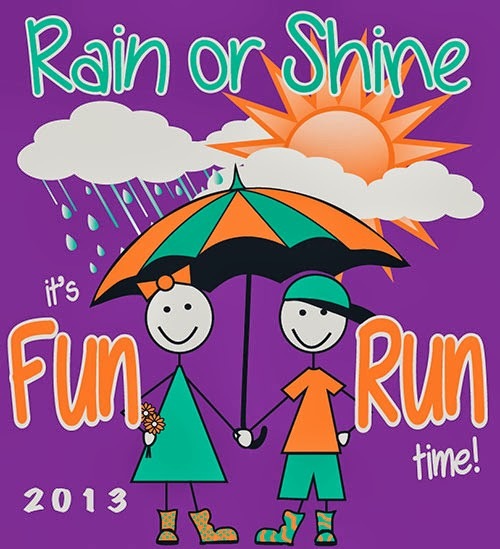 To run in honor of children with cancer and to help raise money for a cause like this makes these runs different than anything else, they give meaning and purpose to the hard runs and the longs runs, it gives meaning to what I try to do week in and week out. It makes the soreness and pain, pale in comparison to what anyone with cancer ever has to endure. 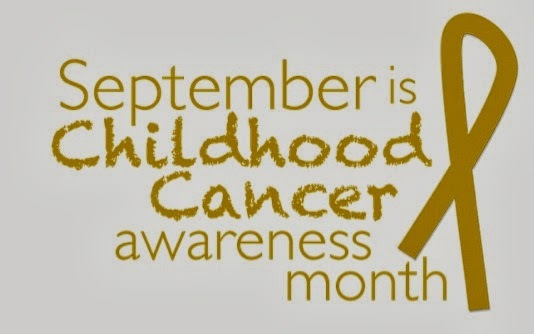 It’s a little step of what anyone can do to bring light and attention to Childhood Cancer. Then I decided to go ahead and pick up Cindy’s packet too since she was still on her way and I had some time to kill. By the way we both opted for a Medium size shirt, but they looked way too big, I’m sure they were just running large but in the end I decided to trade mine for a small and even though I’m not truly a small it still felt really good to make the exchange!! LOL! Soon we located a few others that I knew were signed up for the race and then it was time to line up for the start, this was the first time I have ever been chipped for a race! So I was like “don’t forget to step on the mat, don’t forget to step on the mat!”. Cindy made a bee-line for the front of the line… I wasn’t too sure about that but I ended up following her, and of course I could feel myself starting to get the pre-race nerves! I kept thinking maybe I should move on back, because I know I’m not a fast runner, but before I could make that call it was time to start running! Mile one was good, of course you get wrapped up in the mix of all the people and I had to remind myself to slow down – I did not want to burn myself out! I was feeling good and I kept checking my pace to make sure it was just right, my goal was to keep it under a 12 min mile, mile one beeped in at 11:37! Then of course I started to worry about starting off too fast so I slowed it down some, by this time I was coming up on my old stomping grounds (the lake behind the PTC) I tried to tell myself that it would be a great second mile, but oh boy the heat and sun really started to get to me, I am pretty sure mile two beeped in at 12:12 or something like that. Mile three started and I already knew I would have to try really hard to make my goal time, but then it started that small voice in my head that starts to tell me “you can’t do this” “give up” and then I start to look at the people in front of me and I realize that a lot of them are walking! So instead I started to remind myself that, that is what I train for to keep up my pace when others have thrown in the towel. So I started to concentrate on my breathing and then I started to count my steps- breath in breath out – one… two… breath in breath out…one..two..three -Don’t walk. Then something really cool happened :) I looked up and saw someone, the same someone that was ahead of me at the Chealsy 5k in mile three, at that time I told myself to catch up to him and i never did and now there he was in front of me again. Suddenly I knew I could catch up this time and I could pass him! So I did. At that moment I knew this race was not over and I was not going to slow down! So I just kept up my pace and made my way to the finish, as soon as it was in sight I booked it! And just like that folks it was over! Chip time 37:17 average pace 11:57!! Whew! 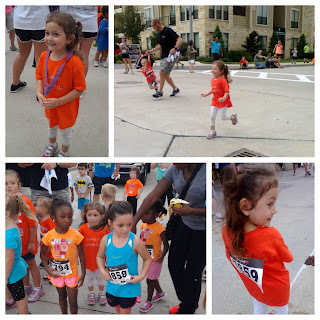 Next on the list was for Hailey to participate in her “Kids Dash” the night before I made her a shirt that said “Sammy Supporter” in bling letters. We ate snow cones and watched the kids mile take off, then we made a quick run to potty and got ready for her run! She was so nervous you could see it all over her little face – but just like anyone else as soon as they yelled “GO” off she went no looking back! Crossing the finish they handed to her, her first medal! Hailey was over the moon! Later Saturday night the girls came over to work on our outfits for next week’s 10K Monster Mash Run! Can’t wait to post pics from that race!! Ready or not! Oh my! Did I tell you the race is on or what! !